When I set out to plan my 2019 schedule I wasn't planning any studio retreats instead we wanted to take a little break and focus on some different goals. And to be honest, I was kinda bummed- teaching in my creative space and getting to spend time with so many of you in real life is one of my favorite things to do. And while we are in the midst of figuring out some big things in our life and business, I've decided to say what heck...and pivot a little bit with my 2019 schedule. I’m throwing caution to the wind and making time for two studio retreats in late spring/early summer. For now, this looks like the only time frame that works with my creative schedule in 2019 so here we go! If you are interested in spending the weekend with me in my studio at the beach, learning all kinds of my messy techniques and concepts, I've got details below or you can visit my shop HERE for additional information. And not to worry if 2019 is not the right time for you, I’ve got big plans for retreats in the coming years!! 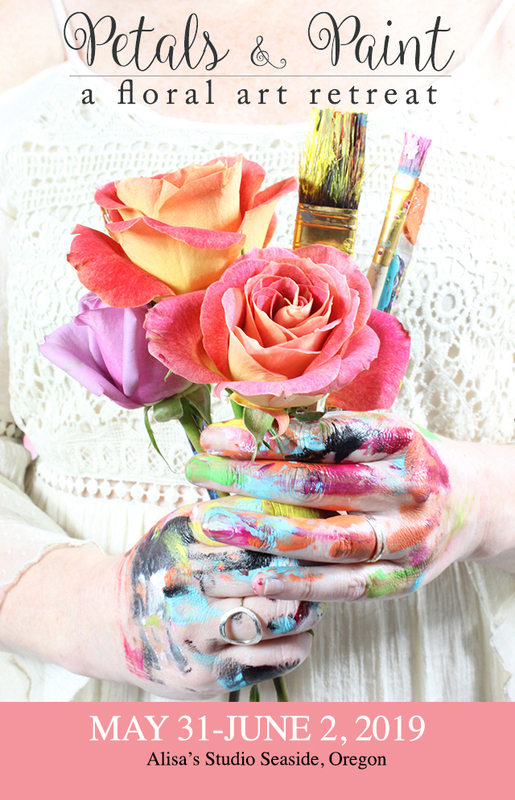 Join me in my studio on the Oregon Coast for three days of color and creativity! 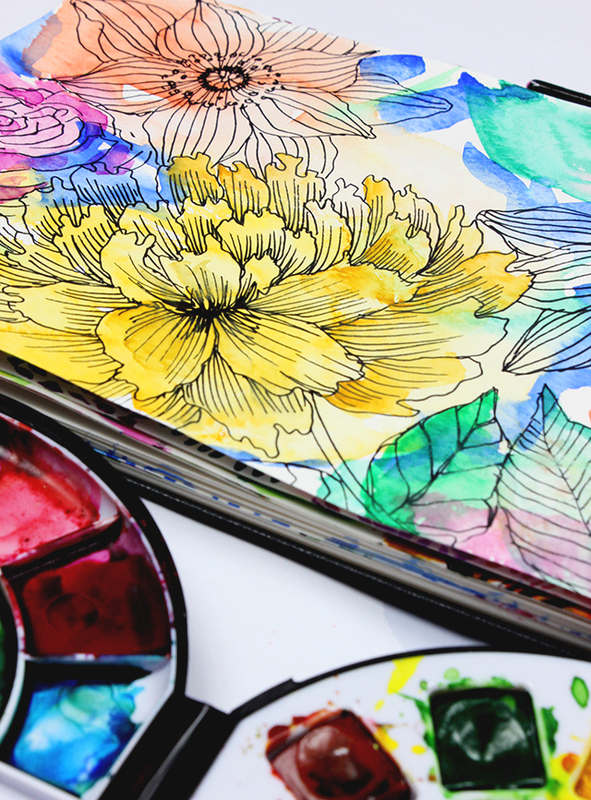 We will be immersing ourselves in my favorite subject matter- flowers. 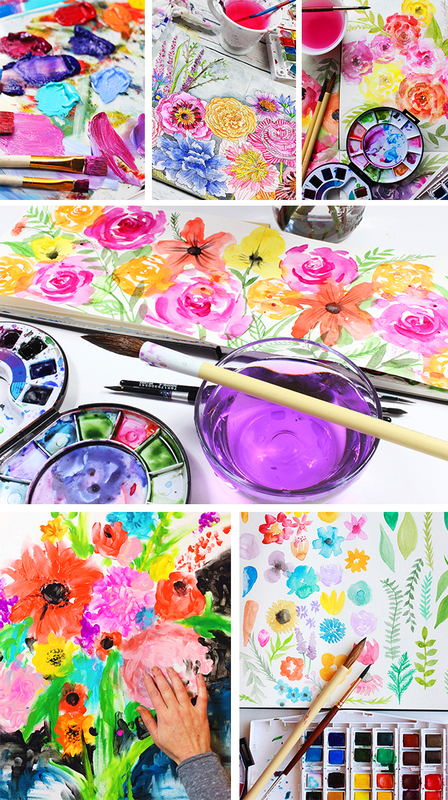 Throughout the three days, I will be demonstrating all kinds of my favorite techniques, tips, tricks and materials for creating beautiful and expressive floral paintings. 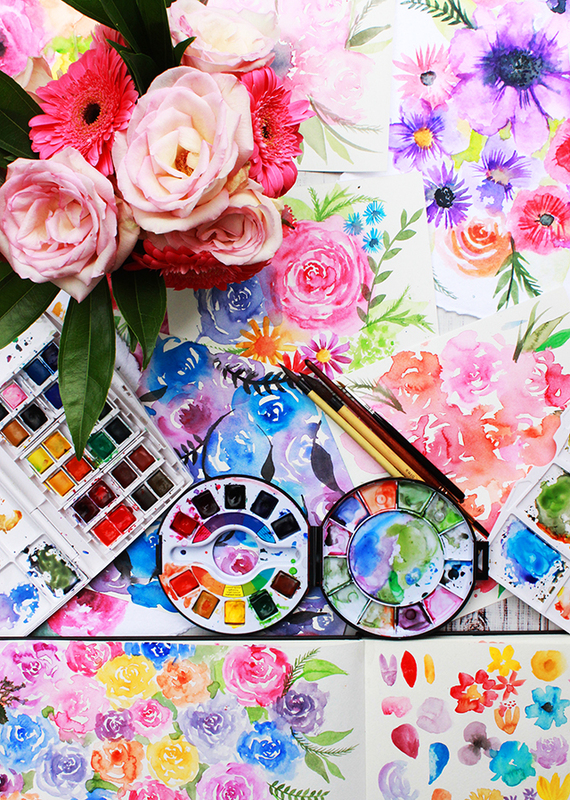 From watercolors to acrylic paint, exploring color, layers, materials and working big and small, we will dive into all things floral. 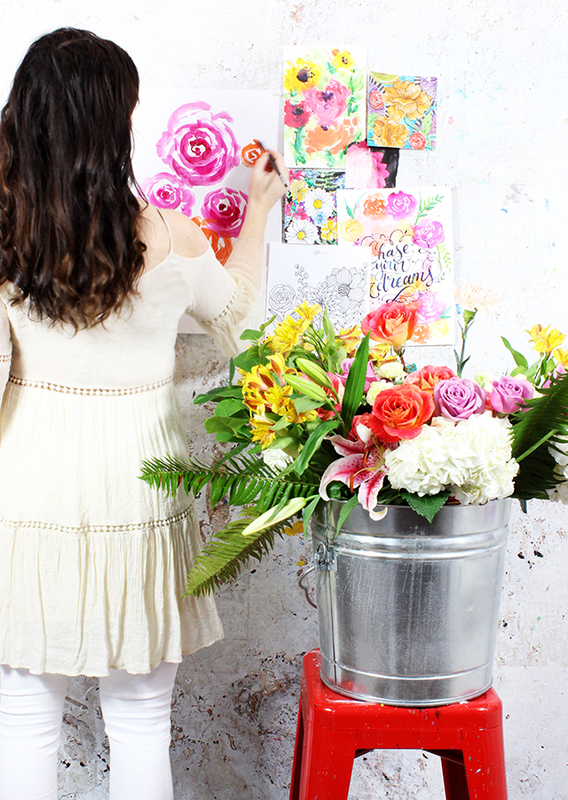 Whether you are a beginner or an intermediate artist, you will come away with tons of inspiration and new ideas for creating floral art. Please note- we have limited space available for this retreat, if all spots are filled we will open up a waiting list. Single day classes are not available. 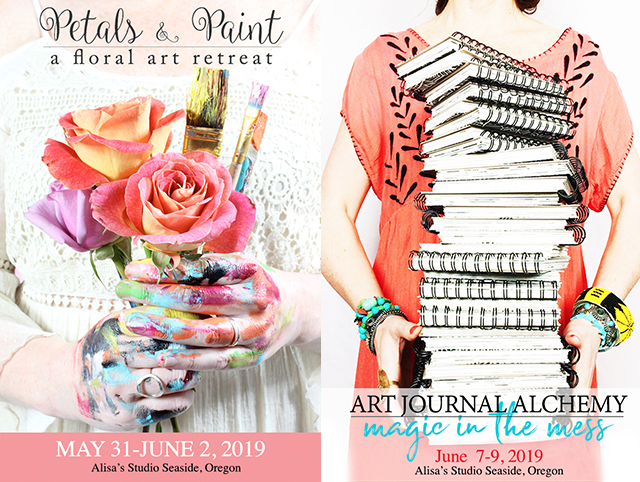 Join me in my studio on the Oregon Coast for three days of creative mess making and exploration! 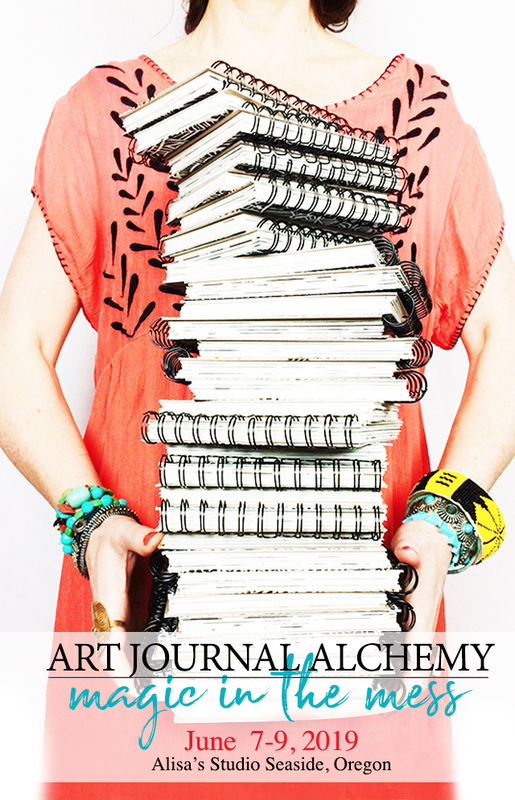 We will be immersing ourselves in all things art journaling. 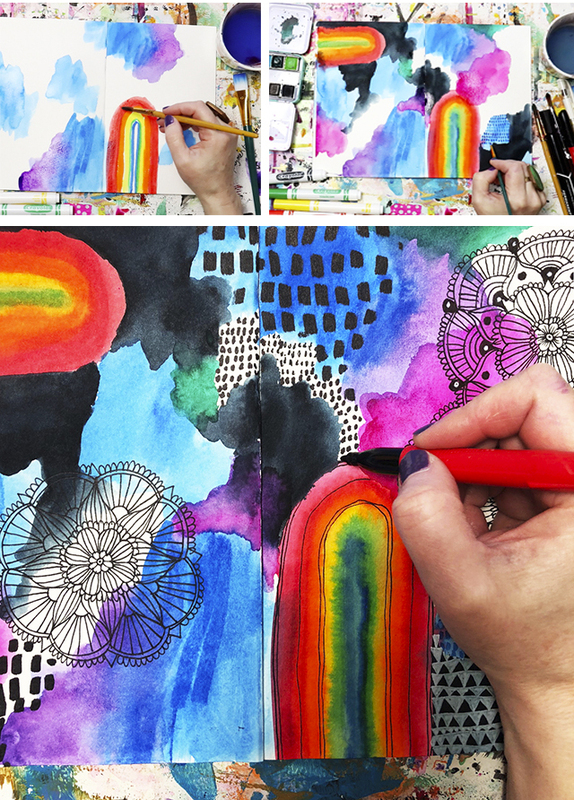 Throughout the three days, I will be demonstrating tons of my favorite techniques, tips, tricks and materials for your art journaling process. 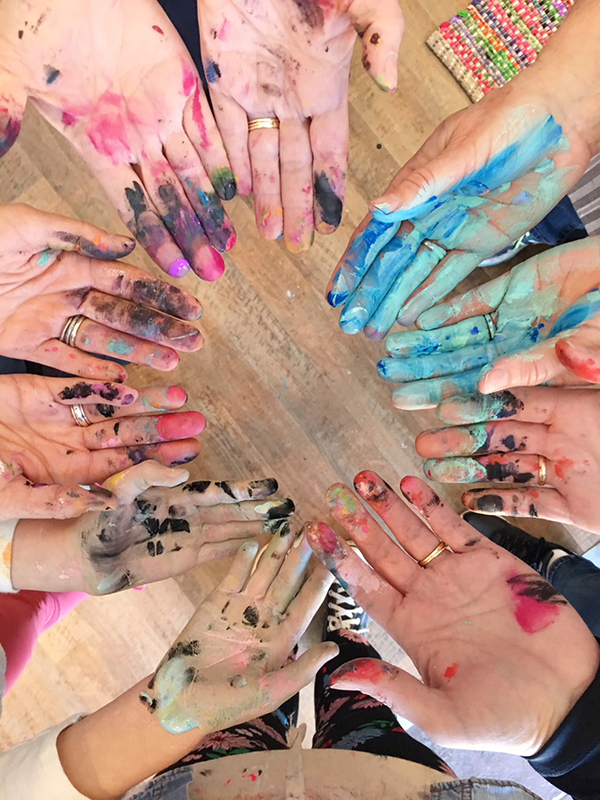 From painting to collage, to free writing, printmaking, drawing, working in layers and more- we will embrace the magic that comes with creative exploration and making a mess on those page! 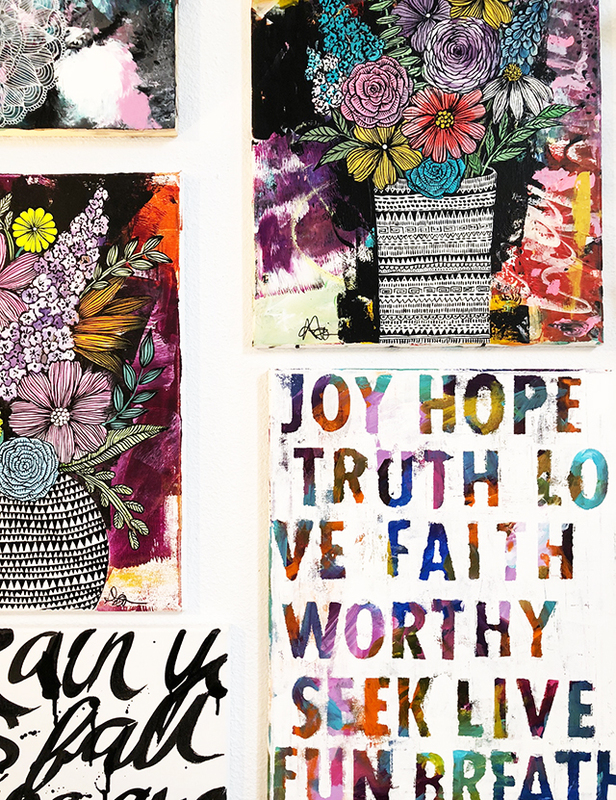 Whether you are a beginner or an intermediate artist, you will come away with tons of inspiration and new ideas for your art journal. $700.00 Early bird special $550.00 until May 1, 2019. 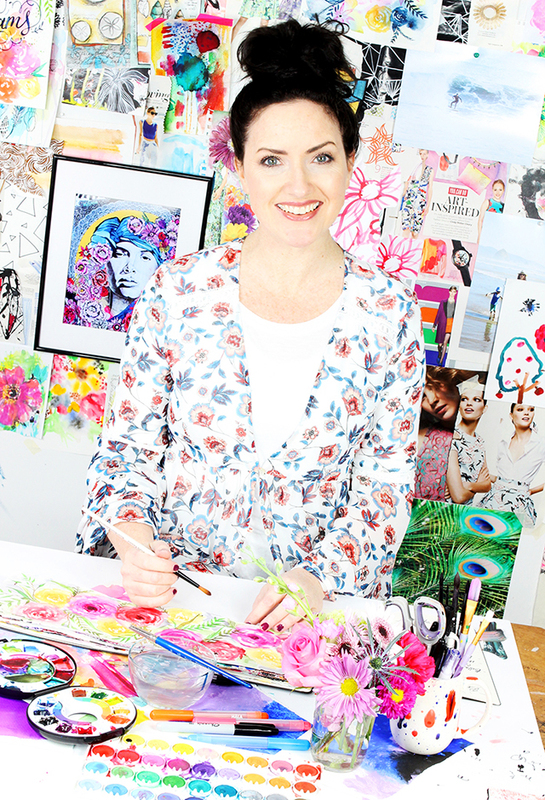 I've been teaching art since 2004 and while I have a formal education in fine art, I love to break the rules! 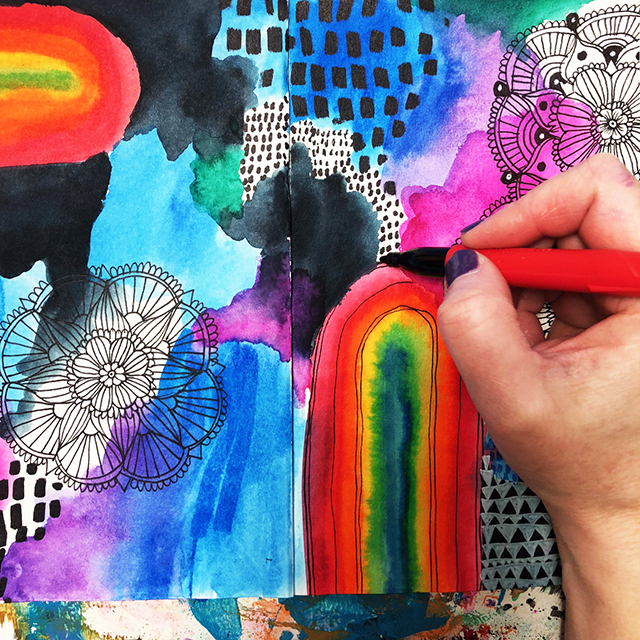 As a teacher, it's my mission to share simple techniques that artists at any level can use to create bold and colorful art. 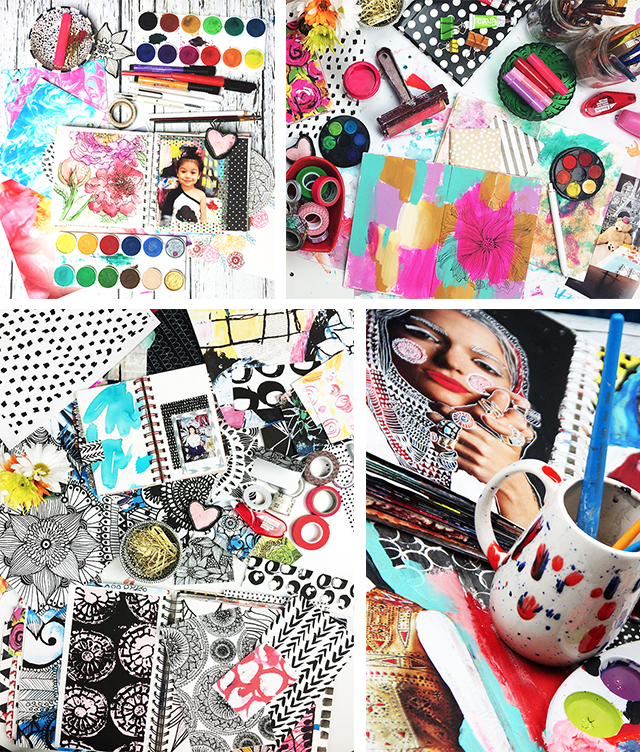 I also like to cram as much creativity as I possibly can into my classes! My goal is to inspire my students and provide new ideas, techniques, live demonstrations, one on one support and the space to make creative discoveries. One of my favorite parts of teaching live, is the having the time to connect with my students, get to know other creatives and answer questions about art, life and business. 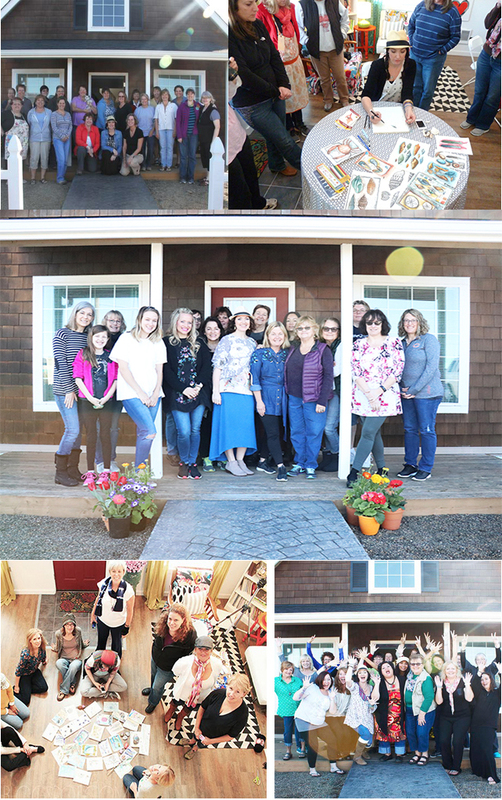 Retreats are held in my art studio in Seaside, Oregon. We do not provide lodging or transportation services. Seaside is a small town and regardless of where you are staying, everything (from the beach to downtown to the grocery store to my studio) is within minutes (driving) of each other. The Oregon Coast has very unpredictable weather that can change at a moments notice. Some of our activities could change or may depend on the weather but be assured rain or shine- we will be having lots of fun together! If you need recommendations or have any questions about class content, travel, lodging or the area feel free to email me at alisaburke@gmail.com. *There is no supply list for my classes. To keep things simple and easy for you- I provide all supplies. If you have favorite supplies (pens, brushes, watercolors or paper) feel free to bring them but they are not required. 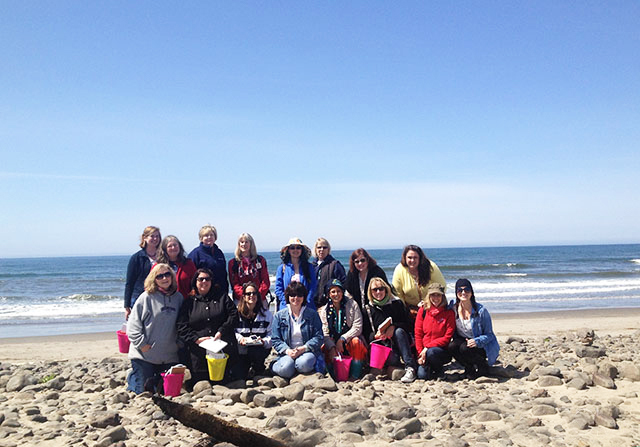 Cost of class includes supplies, lunch and snacks all three days. Cost does not include dinner or any optional activities. 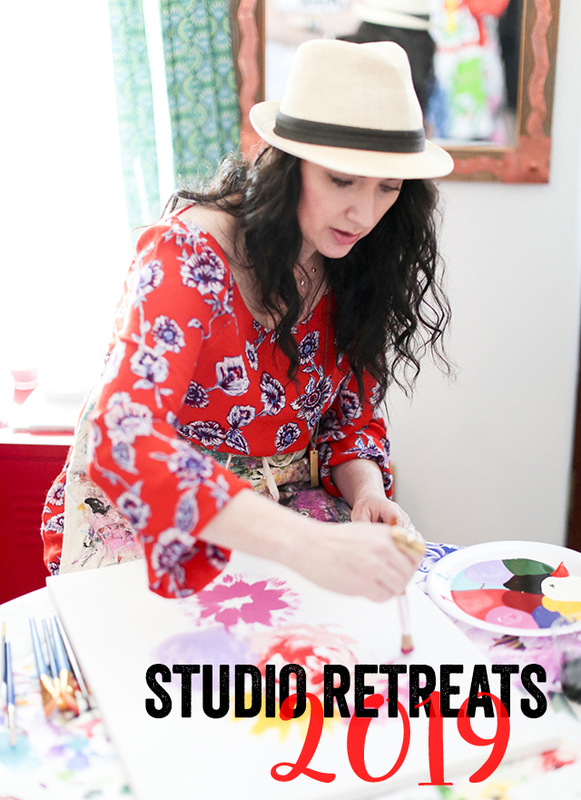 It is so exciting to have a creative space to open up for my classes and retreats! 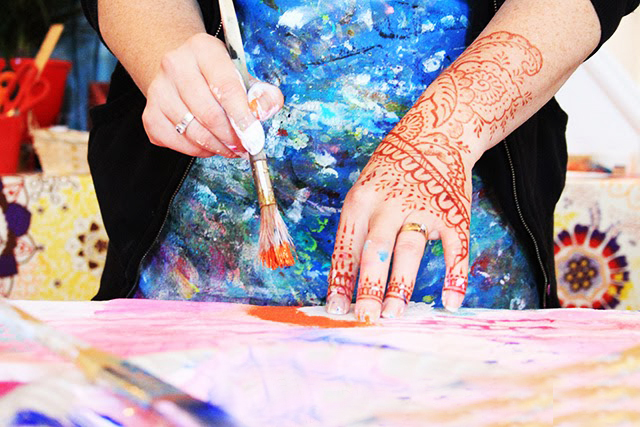 My studio is located in my fabulous hometown of Seaside, Oregon – a lush coastal community with miles of beautiful pristine beaches and vivid ocean views. Seaside is a small coastal resort town surrounded by nature’s wonders: Elk wander freely in our yards; seals mingle with the surfers; gray whales and dolphins graze offshore; tide-pooling at dusk; beach combing after a winter storm unearths treasures washed up from far-off lands half a world away. It’s a combination of the historical past (near Lewis & Clark’s final destination) and quaint modern coastal community. The vintage 1920’s promenade boardwalk skirts the Pacific Ocean for a mile and a half and in the summertime the town is buzzing with activity. This is my hometown and the magnet that has been pulling me back North for so long. 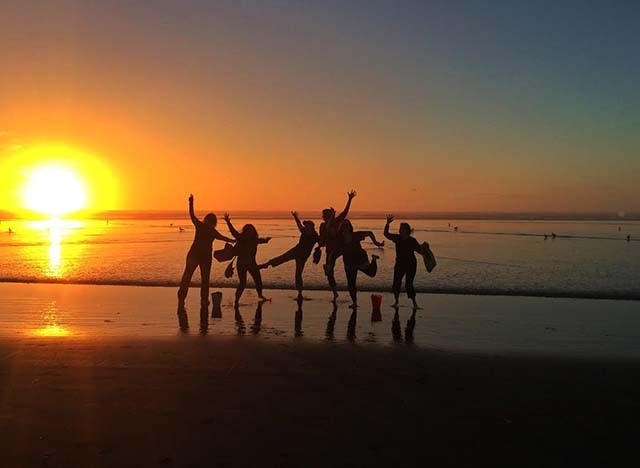 It’s been my greatest dream to offer classes and retreats in Seaside, Oregon and to share the wonders of the Oregon Coast with you. 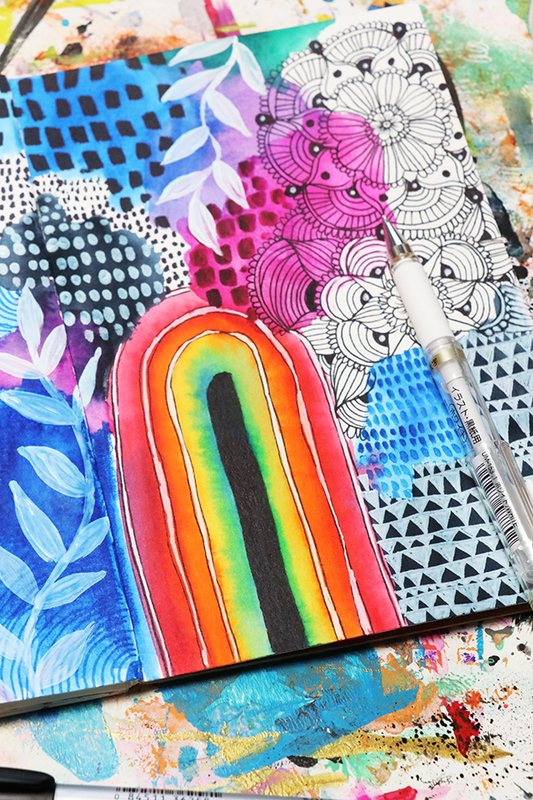 One of my favorite ways to challenge myself creatively is to limit my supplies. 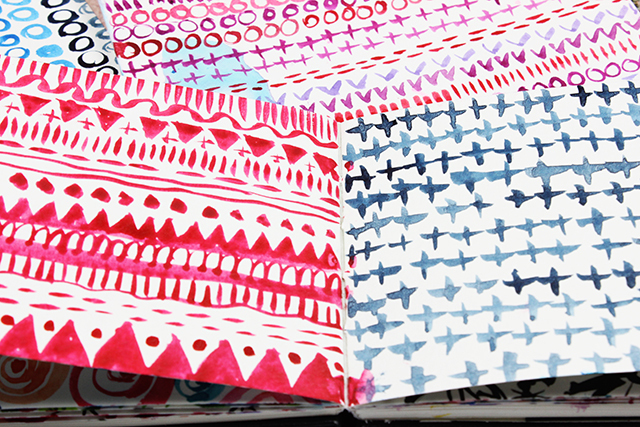 My favorite type of supply for creating simple designs is using a water soluble pen. Currently I am loving the Kaküno Fountain pen from Pilot’s Ensō Collection. The pen comes in a kit with one black and one pink pen with replaceable ink cartridges and two finely crafted nibs that are perfect for drawing illustration. 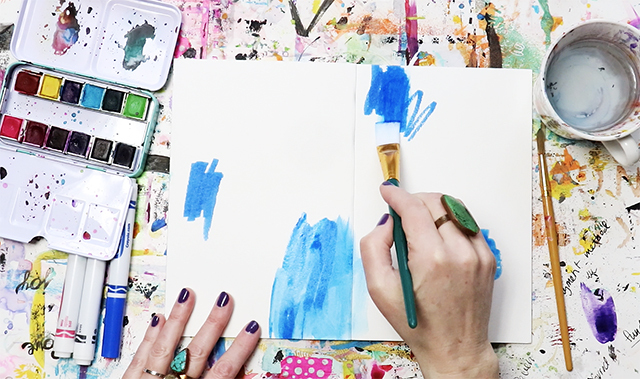 Paired with a brush and water, these simple materials will go a long way in sketching and are perfect when you don't have the time or space to use paint. But when you add water you can dissolve that line and pull away pigment to use for shading. I typically start with a line drawing. I use both light, airy lines while also incorporating bold lines throughout my sketch. Then I use my brush to dissolve those lines. 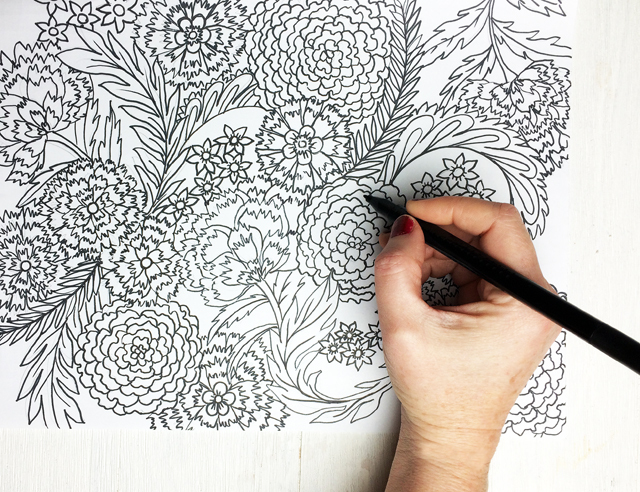 I pull pigment away and then use that pigment to shade, add contrast and bring my line drawing to life. After a little practice it becomes an easy alternative for paint! Using the Kaküno Fountain pen I start with a simple line drawing. Then I go back into the drawing with a brush and water. I dissolve those lines with my brush in places where I want to add shading. The more water you add, the lighter that pigment will become. I like to work back and forth in layers, adding more lines to the top of my shading to darken up some areas. Using a fountain pen for drawing is new for me but I’ve got to say that the Kaküno Fountain pen has quickly become a favorite supply for this process. The result is a really dynamic drawing created with few supplies! Right now, Pilot is offering 20% off Kaküno Fountain pens, as well as the entire Ensō Collection, when you use code 20ARTIST on Amazon.com. Sketching is a HUGE part of my life, it is the way that I practice, the way that I brainstorm ideas and even a way that I able to process and get my emotions out. I've spent years drawing, sketching and doodling and what I've found is that making time everyday for a sketching routine has made me more inspired, more creative and a better artist. 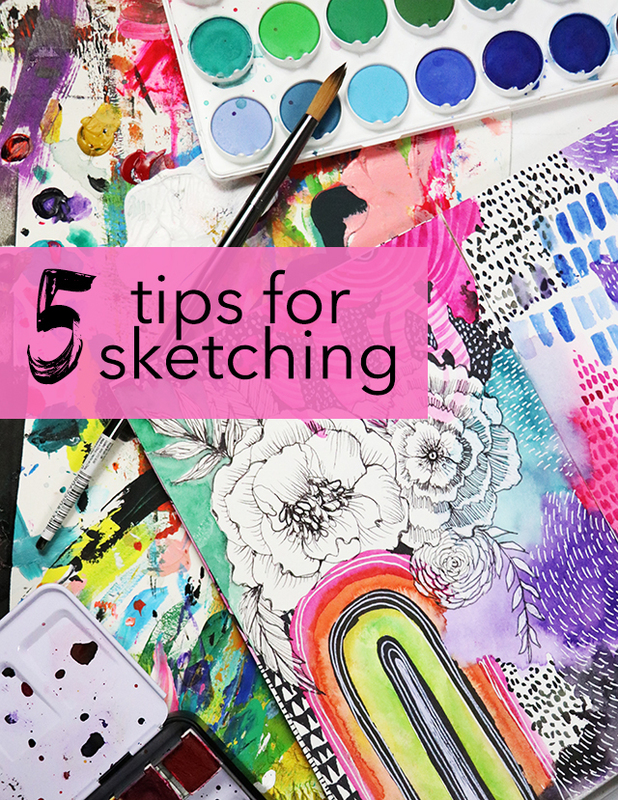 There are 5 tips to inspire your own sketching routine! While I don't believe in spending lots of money on supplies, my materials are a really important part of my drawing process. 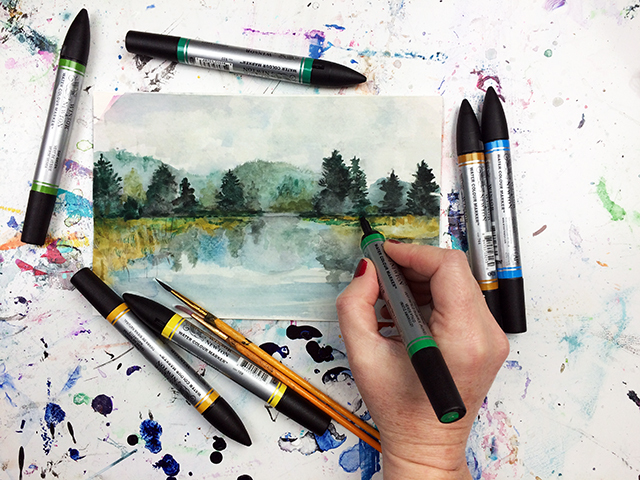 The inspiration to sketch can hit at any time and I like to have all of my supplies on hand. There is nothing worse than wanting to draw but not having the right materials available. Before I purchase anything new, I always hunt for supplies that I already own and take time to explore them. I dig through my junk drawers, look around my studio and collect everything that can be used for drawing or doodling. I toss all these supplies into a big pouch and keep it next to my sketchbooks so I can grab everything I need to get busy drawing. I like to take my supply gathering process a step further and explore everything that I have. I am always surprised at what I am able to find in my studio- supplies that I have forgotten about, supplies that are dried up or even ruined but still useable. Taking time to "reacquaint" myself with these supplies actually inspires me. I typically use a few blank pages and scribble, shade and make marks to remind myself what I can do with my materials. 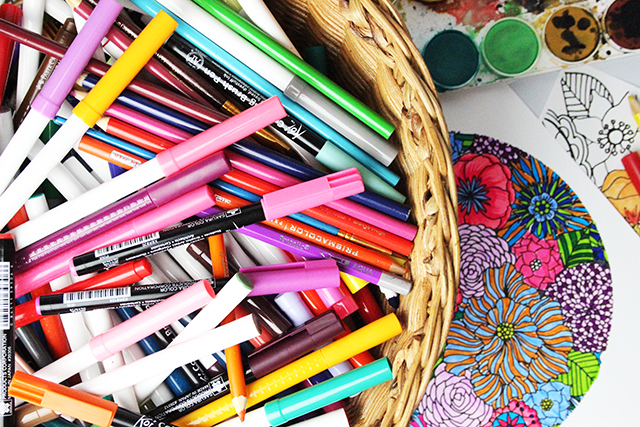 Don't throw away dried out pens. You can use them in for adding light shading and subtle details to those drawings! Dried out paint brushes the ones that don't get rinsed are a great tool for dipping in ink or acrylic paint. The stiff bristles are a wonderful way to add unique texture to an ink drawing. White out pens and correction ink work great for drawing on black paper. 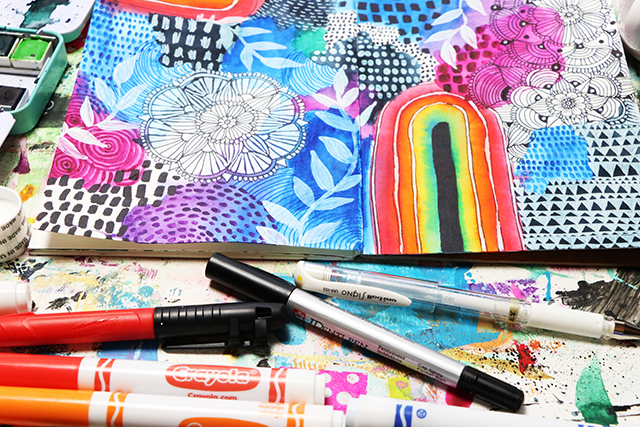 White colored pencils and crayons can be used to create a resist if you paint over the top of them. 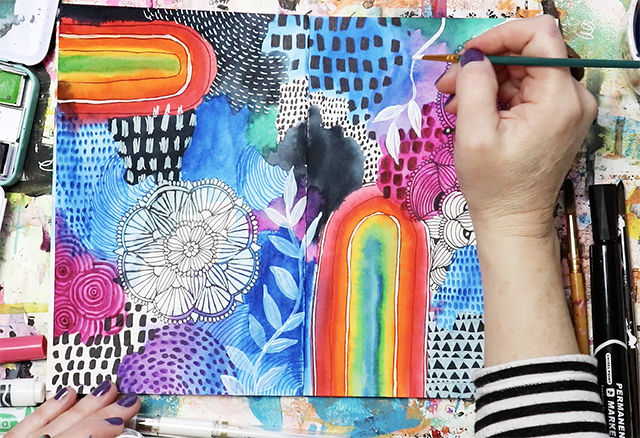 The best thing you can do to begin a sketching, drawing or doodling routine is to commit time everyday to DOING IT! Sketching is just like any other practice and has always reminded me of exercise- it requires work, it can be painful in the beginning but after your get into a routine, the benefits FAR outweigh the the discomfort. Making time everyday, even if it's only 10 minutes, will set you on your way to getting better and more comfortable with the process. 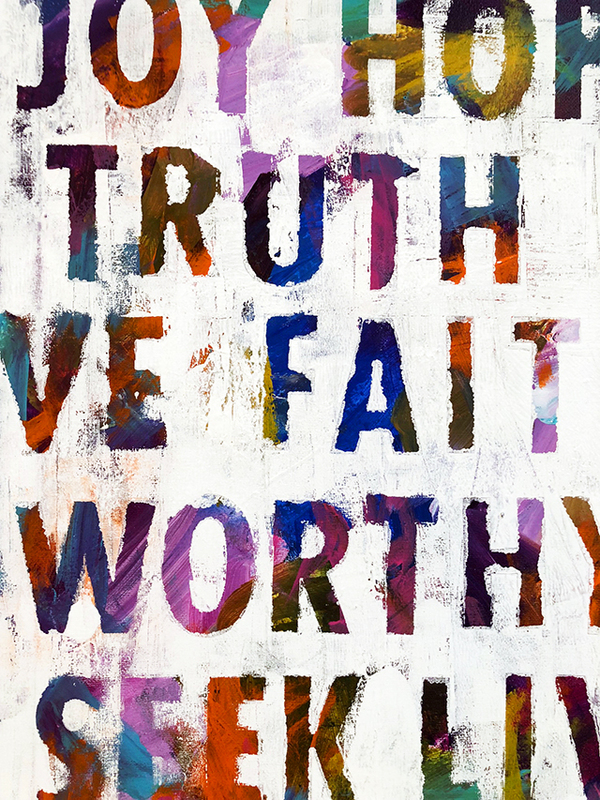 Inspiration and seeking ideas that are authentic, is one of the most important ways that I keep my work fresh. Sometimes the hardest part of the drawing process is facing a blank page and coming up with new ideas. For me it is necessary to stay off the computer and be present in my life and my surroundings. My secret is looking at my schedule, my routine and the things in my life as potential inspiration for for my drawing process. I rely on the everyday moments and things as subject matter and fuel for my drawing. Begin looking at your life (even the boring stuff) as potential for inspiration. Forget about creating drawings that anyone will see. 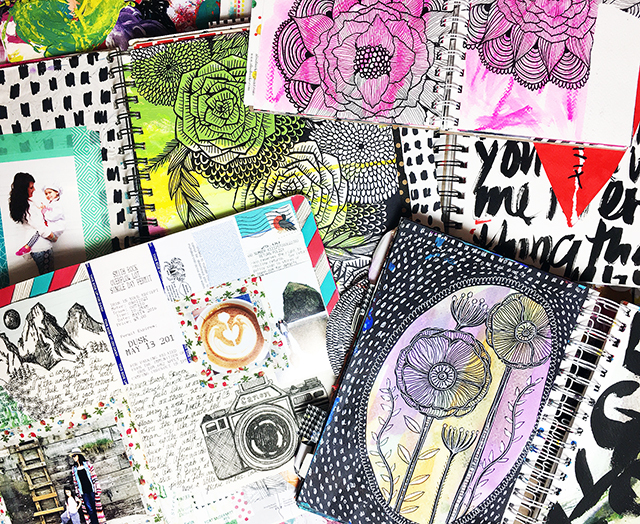 Instead, accept that drawing can be just like keeping a private diary or journal. Find things in your everyday life to record visually. Meals, your clothing, pets, the plants in your garden, houses in your neighborhood are all great subject matter for sketching. Lets face it, starting any kind of new routine can feel stressful and be filled with the pressure to succeed right away. 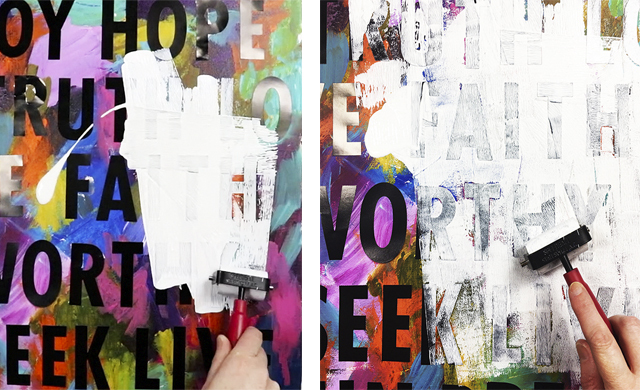 To top off that pressure, inspiration doesn't always strike when you have free time. I've found that giving myself 10-15 minutes a day just to draw ANYTHING (even scribbles and shapes) really helps take the pressure off. Once you stop thinking you need to draw something beautiful, perfect or complete, you are better able to relax into the process. 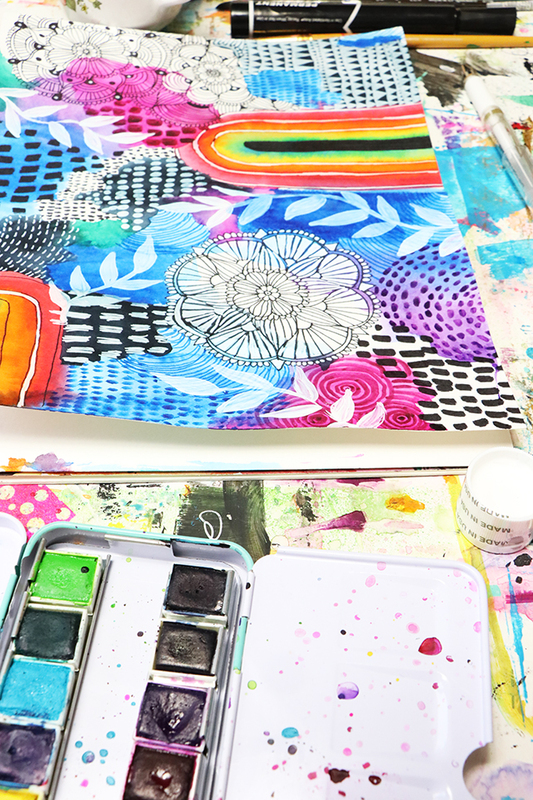 Instead of coming up with big grand ideas, I like to look around me and draw the things that I see- supplies on my desk, my grocery list, my outfit, my art supplies, the things in my purse, etc. Once you see potential in the everyday things around you, there is so much to draw and use as inspiration. When all else fails...scribble! I know this sounds weird but there are days when I just don't feel like like drawing but I make myself pull out my drawing supplies and fill a couple of pages. On days like this, I scribble and make expressive marks and lines. 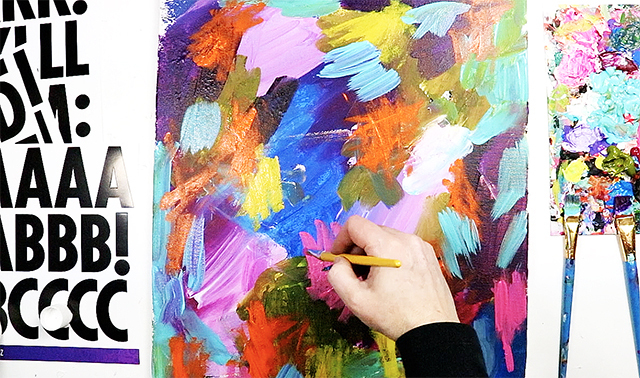 Even though it's simple, this process always makes me feel creative and inspired! For those of you who are looking to start a sketching routine or even interested in learning to draw, I've got some of a few of my favorite drawing and doodling online classes marked down today!